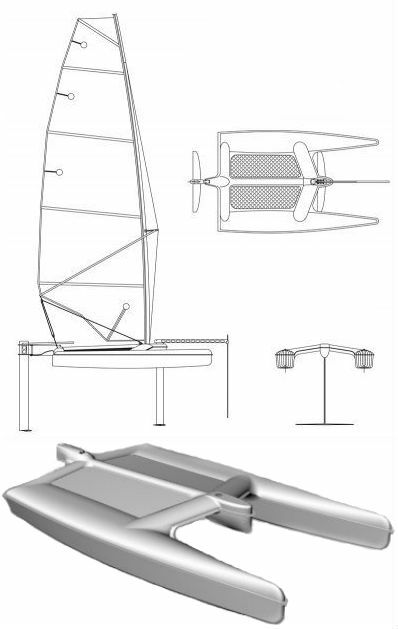 The UFO is the first foiling sailboat that balances incredible high performance foiling with stability of a catamaran tunnel hull design in a small size for easy transportation at an affordable price. There is a certain level of fitness to be able to sail it but once mastered you will be addicted to foiling. If you are interested in seeing the UFO and/or trying it out please contact me, Miles Moore at funtosail@gmail.com or text me at 208-704-4454. I received and sailed my UFO just this 2018. The UFO is a modern design hydrofoiler, based on recent technological advances in sailing hydrofoils, that allows anyone to fly above the water. More stable than the International Moth, with a simple rig, and a set of fully retractable foils, all for under $7,930 USD. The UFO provides the easiest and most affordable foiling experience, while maintaining a one-design philosophy creating close and exciting racing on foils! 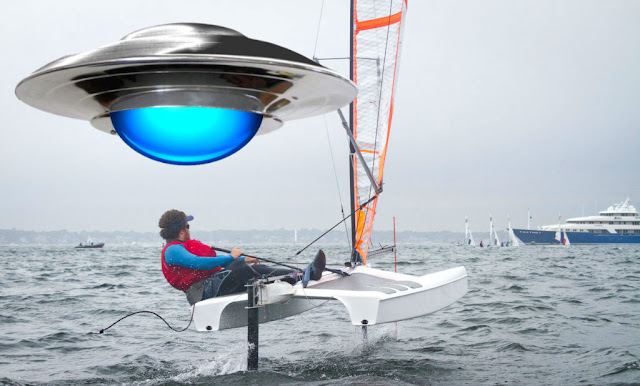 The UFO is a novel implementation of recent technological advances in sailing hydrofoils to radically increase the fun factor of a simple affordable sailing toy. By mating the highly refined wand driven centerline T-foil system, tested and proven in the International Moth class, with a simple tunnel-hulled catamaran hull shape, the UFO offers the otherworldly joy of zipping around up in the air. 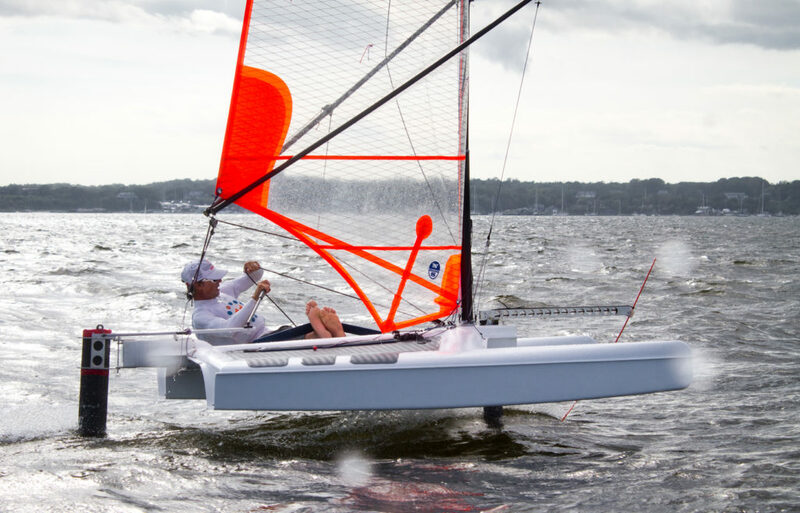 All without any of the complexity, fragility, or cost found in today’s foiling boats. It’s about simplifying and increasing consistent access to the flying experience. Simplicity, durability, and function were the core criteria in the development of the UFO. The hull is constructed of two unified top/bottom moldings for maximum build consistency. With vinylester infused, Soric cored, fiberglass structure, with carbon fiber reinforcement in the beams. The combination of vinylester and Soric notably render the hull outstandingly rugged and seemingly impossible to dent. The hull is remarkably light, weighing in at 70 lbs (31.5kg), which makes it easy to handle and transport. The flat bottoms of the hulls make car top transport easy. With the addition of a conventional beach-wheels style dolly the UFO becomes exceptionally easy to move around, whether on the beach, in the launch, to another venue, or even to another country. While the UFO is a ‘sit on’ rather than ‘sit in’ boat, its EVA foam deck padding makes it comfortable for the knees, shins, and posterior. The deck rigging layout is as simplified as possible, featuring no long tails, take-ups or needless bits of line. Fulcrum’s rigging philosophy is “the more sophisticated the system, the more likely it is to snag and ultimately decay”. Our unique jumper-strut wish-boom rig provides safety, performance, and simplicity. The remarkable speed of hydrofoils is driven by removing the hull from the drag of the water; conversely, regaining contact with the water while flying leads to rapid deceleration. Learning to fly has resulted in some nasty bruises and cuts in other foiling boats as the boat rapidly slows and the sailor continues forward into the shrouds, wing bars, or withdrawn foils. Keeping the “splashdown path” clear for the sailor was a must in the UFO design. So while the UFO rig takes advantage of the benefits of stays, they play no part in securing the rig to the boat, instead reversing back to the deck collar at the mast base, clear of the splashdown path. Further, the jumper stay arrangement provides a broad tuning range of rig stiffness, enabling the boat to be powered up or de-powered to taste. The mast collapses into three parts and is made of carbon fiber and a carbon-glass mix, depending on the stiffness requirements of each segment. The boom sprits are also made of a carbon glass mix for stiffness and durability. The fully battened mylar sail is made and designed by North Sails, and is raised with a halyard rather than capsizing the hull. The sail endplates to the deck for increased performance as demonstrated by C-class and America’s Cup boats. For storage and transport the wishboom collapses easily to pack with the mast sections. 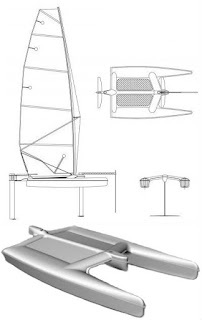 The centerline T-foil arrangement has been the core foiling technology for the International Moth class since the early 00’s. As a result, it currently stands alone for its thousands of hours of testing and refining, and its countless iterations of development to the present day. It is the most proven hydrofoil technology in existence and thus forms the basis for the UFO’s foiling system. The UFO flies on a pair of centerline T-foils, made from a hybrid foam cored carbon/glass composite and fixed to the bottom of the mainfoil and rudder’s struts. The combination of these foils and the tunnel hullshape allows for full retraction of the horizontal elements between the hulls. This makes the boat very easy to launch without worrying about damaging the foils, or even for the UFO to be landed “beach-cat style” straight on the sand. The mainfoil has a control flap along its trailing edge, which is driven by a wand at the bow. The wand detects the distance of the hull from the surface and automatically corrects the flap position, controlling flight and keeping it within the range set by the sailor. “Ride height”, the desired elevation of the hull above the water, is set by changing the extended length of the wand as a ‘set and forget’ tuning. Ride height can be set low to keep the hulls close to the water and assure a certain degree of safety and stability, a sailing mode nick-named “training wheels” by the design team. The ride height can then set incrementally higher as one’s comfort with flying high and fast increases. The rudder foil possesses no active controls, though it can be tuned with a ‘set and forget’ built-in angle of attack adjuster, a feature also available on the mainfoil. This enables the foils to be adjusted for the wind conditions of the day.